In-market targeting for search campaigns. Now you probably haven’t seen this…especially if you are one of the first people to read this post or watch this video…because nobody has been talking about this. I follow all the AdWords news there is to follow. Nobody has been talking about this. Google hasn’t even announced it. They did announce it about a year ago – it was one of those things where they said it is going to be released in the future, and it’s taken them this long to finally release it. From what I’ve seen it’s available now in every account and this could be a game-changer. (Yeah I said it, a game-changer) and I will tell you and show you why here in this post. So, in-market audiences for search campaigns. 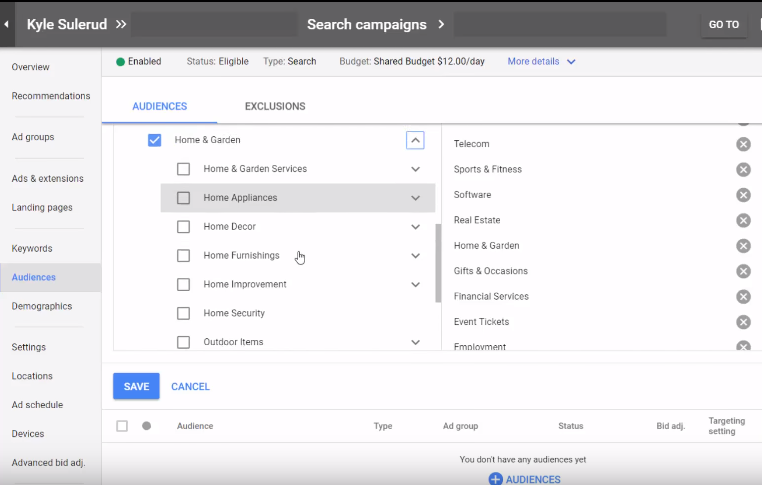 First off, in-market audiences have been available for a while in display campaigns. I’m not a big fan of them. 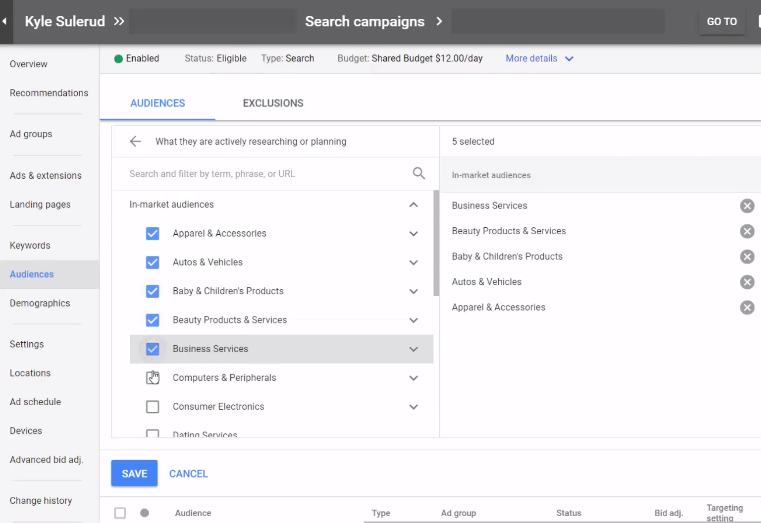 I don’t think the data is that good – I’ve never really gotten them to work for display campaigns – but I think in search campaigns there are a lot of possibilities here and these audiences could work very well (especially if the quality of Google’s lists keeps improving). An in-market audience is basically an audience of people who Google has identified is “in the market” for a particular product or service. So let me show you how to add these to your campaign and then I will give you a couple of my thoughts on how you might be able to utilize this feature. You can set these up for a campaign or for a specific ad group. I’m just going to leave it at Campaign. If you target an audience your ads will only show to people who are in a particular audience. That is going to limit your traffic quite a bit. About half of the people who use Google aren’t really identified at all, so they aren’t gonna be in any audiences. Plus the audiences probably aren’t perfect. 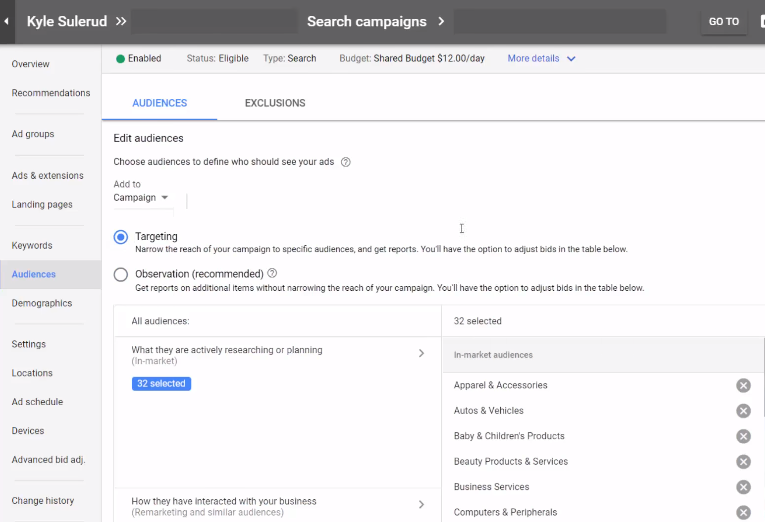 So if you’re only targeting the audiences in a search campaign you’re going to be limiting your campaign quite a bit – but it is an option and I’ll tell you why we might want to use that option here shortly. The other option is Observation. This is going to add all the audiences to our campaign but it’s not going to change anything. You’ll still be targeting everyone, it’s just going to start collecting the data for whatever audiences you’ve added. Then you can choose the audiences below. It used to be you could only add remarketing audiences to these campaigns (and it wasn’t that long ago we couldn’t even do that). So, first they allowed us to add remarketing. Now we can add in-market audiences so you’d select this and it’ll show you all the audiences. You can use the search bar at the top and it will give you some results that might be relevant to what you’re searching for. You will also see the categories listed. Once you start to expand them you’ll see there are quite a lot of subcategories. Hundreds. So what you can do and what I’d recommend to start with is add all the audience’s to your campaigns so you can start observing them. You want to see if the people in these audiences…if there’s any effect on the results. I just noticed these about a week ago, so I can’t really give you advice on how to utilize them and the best practices at this point, but that’s what I’m doing – I’m just adding all the audiences for observation. Now let’s say I have a client who is a painter, for example. I might select all of the home and garden categories since they’re somewhat relevant to painting, home improvement, etc. So let me show you what this looks like when you add all these audiences. Once you save, all the audiences you selected will appear like in the image below. Once we start running more traffic through this we’re going to start seeing results here. We’re going to see clicks, impressions, etc. We can add columns just like anywhere else for conversions and all that good stuff. Eventually then what I can do is see if some of these audiences are performing better or worse for this particular campaign. And then I can go here and adjust the bids if a particular audience is performing well. So for a painting company if Google’s data is good – if they have a good grasp on who is in the market for painting services – then the “paint services” audience should perform pretty well right? Do you think someone in that audience might be worth a little more to a painting company than someone who’s not in the audience? Especially if Google has already identified that that person is shopping around for painting services? They’re closer now to the bottom of the funnel which is a great place to capture traffic in a search campaign. So we might want to go in and increase our bid for people in the paint category. The other thing we might want to do is this: Earlier I mentioned the targeting option (not the observation option). Now I can set up an ad group, I can target people who are in the market for painting services, and then I can go in and add some broad keywords. Keywords you would never add to a search campaign normally – maybe keywords like “paint” or “painting” – keywords that are usually just too broad to really be useful to us. But if we combine that with the knowledge that Google has about the people and combine it with the fact that they’re on an in-market list, well now we might have something. We might be able to target a lot more traffic…especially traffic nobody else is going to be targeting because…look…it’s May 21st – if you’re one of the first people watching this video you’re gonna be one of the first people using this feature because, like I said, nobody has been talking about this. Even years from now most people probably still aren’t going to be using in-market audience targeting. So if you are utilizing this information you’re going to be way ahead of everyone. So that’s all I’m going to get into now. I know there’s a lot more depth we could get into with this – especially once I get in here do some more testing of my own. Typically this is just the kind of thing I’ll share with my mastermind group so don’t expect another video or post from me on the in-market stuff. But I wanted to at least come show you how to set it up and what some of the possibilities are. I will talk to you later.